The ninth President of the United States, William Henry Harrison was born at Berkeley, Charles City county, Virginia, on the 9th of February 1773, the third son of Benjamin Harrison (c. 1740-91.) His father was long prominent in Virginia politics, and became a member of the Virginia House of Burgesses in 1764, opposing Patrick Henry's Stamp Act resolutions in the following year; he was a member of the Continental Congress in 1774-77, signing the Declaration of Independence and serving for a time as president of the Board of War; speaker of the Virginia House of Delegates in 1777-82; governor of Virginia in 1781-84; and in 1788 as a member of the Virginia Convention he actively opposed the ratification of the Federal Constitution by his state. 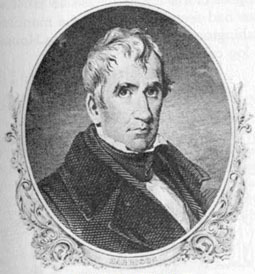 William Henry Harrison received a classical education at Hampden-Sidney College, where he was a student in 1787-90, and began a medical course in Philadelphia, but the death of his father caused him to discontinue his studies, and in November 1791 he entered the army as ensign in the Tenth Regiment at Fort Washington, Cincinnati. In the following year he became a lieutenant, and subsequently acted as aide-de-camp to General Anthony Wayne in the campaign which ended in the battle of Fallen Timbers on the 10th of August 1794. He was promoted to a captaincy in 1797 and for a brief period served as commander of Fort Washington, but resigned from the army in June 1798. Soon afterwards he succeeded Winthrop Sargent as secretary of the Northwest Territory. In 1799 he was chosen by the Jeffersonian party of this territory as the delegate of the territory in Congress. While serving in this capacity he devised a plan for disposing of the public lands upon favorable terms to actual settlers, and also assisted in the division of the Northwest Territory. It was his ambition to become governor of the more populous eastern portion, which retained the original name, but instead, in January 1800, President John Adams appointed him Governor of the newly created Indiana Territory, which comprised until 1809 a much larger area than the present state of the same name. He was not sworn into office until the 10th of January 1801, and was Governor until September 1812. Among the legislative measures of his administration may be mentioned the attempted modification of the slavery clause of the ordinance of 1787 by means of an indenture law -- a policy which Harrison favored; more effective land laws; and legislation for the more equitable treatment of the Indians and for preventing the sale of liquor to them. In 1803 Harrison also became a special commissioner to treat with the Indians "on the subject of boundary or lands", and as such negotiated various treaties -- at Fort Wayne (1803 and 1809), Vincennes (1804 and 1809) and Grouseland (1805) -- by which the southern part of the present state of Indiana and portions of the present states of Illinois, Wisconsin and Missouri were opened to settlement. For a few months after the division in 1804 of the Louisiana Purchase into the Orleans Territory and the Louisiana Territory he also acted as governor of the Louisiana Territory -- all of the Louisiana Purchase north of the thirty-third parallel, his jurisdiction then being the greatest in extent ever exercised by a territorial official in the United States. The Indian cessions of 1809, along the Wabash river, aroused the hostility of Tecumseh and his brother, familiarly known as "The Prophet", who were attempting to combine the tribes between the Ohio and the Great Lakes in opposition to the encroachment of the whites. Several fruitless conferences between the governor and the Indian chiefs, who were believed to be encouraged by the British, resulted in Harrison's advance with a force of militia and regulars to the Tippecanoe river, where (near the present Lafayette, IN) on the 7th of November 1811 he won over the Indians a victory which established his military reputation and was largely responsible for his subsequent nomination and election to the presidency of the United States. From one point of view the battle of Tippecanoe may be regarded as the opening skirmish of the war of 1812. When in the summer of 1812 open hostilities with Great Britain began, Harrison was appointed by Governor Charles Scott of Kentucky major-general in the militia of that state. A few weeks later (22nd August 1812) he was made brigadier-general in the regular U.S. army, and soon afterwards was put in command of all the troops in the north-west, and on the 2nd of March 1813 he was promoted to the rank of major-general. General James Winchester, whom Harrison had ordered to prepare to cross Lake Erie on the ice and surprise Fort Malden, turned back to rescue the threatened American settlement at Frenchtown (now Monroe), on the Raisin river, and there on the 22nd of January 1813 was forced to surrender to Colonel Henry A. Proctor. Harrison's offensive operations being thus checked, he accomplished nothing that summer except to hold in check Proctor, who (May 1-5) besieged him at Fort Meigs, the American advanced post after the disaster of the river Raisin. After Lieutenant Oliver Hazard Perry's naval victory on the 10th of September 1813, Harrison no longer had to remain on the defensive; he advanced to Detroit, re-occupied the territory surrendered by General William Hull, and on the 5th of October administered a crushing defeat to Proctor at the battle of the Thames. In 1814 Harrison received no active assignments to service, and on this account and because the secretary of war (John Armstrong) issued an order to one of Harrison's subordinates without consulting him, he resigned his commission. Armstrong accepted the resignation without consulting President James Madison, but the president later utilized Harrison in negotiating with the north-western Indians, the greater part of whom agreed (22nd July 1814) to a second treaty of Greenville, by which they were to become active allies of the United States, should hostilities with Great Britain continue. This treaty publicly marked an American policy of alliance with these Indians and caused the British peace negotiators at Ghent to abandon them. In the following year Harrison held another conference at Detroit with these tribes in order to settle their future territorial relations with the United States. From 1816 to 1819 Harrison was a representative in Congress, and as such worked in behalf of more liberal pension laws and a better militia organization, including a system of general military education, of improvements in the navigation of the Ohio, and of relief for purchasers of public lands, and for the strict construction of the power of Congress over the Territories, particularly in regard to slavery. In accordance with this view in 1819 he voted against Tallmadge's amendment (restricting the extension of slavery) to the enabling act for the admission of Missouri. He also delivered forcible speeches upon the death of Kosciusko and upon General Andrew Jackson's course in the Floridas, favoring a partial censure of the latter. Harrison was a member of the Ohio senate in 1819-21, and was an unsuccessful candidate for the National House of Representatives in 1822, when his Missouri vote helped to cause his defeat; he was a presidential elector in 1824, supporting Henry Clay, and from 1825 to 1828 was a member of the United States Senate. In 1828 after unsuccessful efforts to secure for him the command of the army, upon the death of Major-General Jacob Brown, and the nomination for the vice-president, on the ticket with John Quincy Adams, his friends succeeded in getting Harrison appointed as the first minister of the United States to Colombia. He became, however, an early sacrifice to Jackson's spoils system, being recalled within less than a year, but not until he had involved himself in some awkward diplomatic complications with Bolivar's autocratic government. For some years after his return from Colombia he lived in retirement at North Bend, Ohio. He was occasionally "mentioned" for governor, senator or representative, by the anti-Jackson forces, and delivered a few addresses on agricultural or political topics. Later he became clerk of the court of common pleas of Hamilton county -- a lucrative position that was then most acceptable to him. Early in 1835 Harrison began to be mentioned as a suitable presidential candidate, and later in the year he was nominated for the presidency at large public meetings in Pennsylvania, New York and Maryland. In the election of the following year he attracted a large part of the Whig and Anti-Masonic vote of the Middle and Western states and led among the candidates opposing Martin Van Buren, but received only 73 electoral votes while Van Buren received 170. His unexpected strength, due largely to his clear, if non-committal, political record, rendered him the most "available" candidate for the Whig party for the campaign of 1840, and he was nominated by the Whig convention at Harrisburg, PA, in December 1839, his most formidable opponent being Henry Clay, who, though generally regarded as the real leader of his party, was less "available" because as a mason he would alienate former members of the old Anti-Masonic party, and as an advocate of a protective tariff would repel many Southern voters. The convention adjourned without adopting any "platform" of principles, the party shrewdly deciding to make its campaign merely on the issue of whether the Van Buren administration should be continued in power and thus to take full advantage of the popular discontent with the administration, to which was attributed the responsibility for the panic of 1837 and the subsequent business depression. Largely to attract the votes of Democratic malcontents the Whig convention nominated for the vice-presidency John Tyler, who had previously been identified with the Democratic party. The campaign was marked by the extraordinary enthusiasm exhibited by the Whigs, and by their skill in attacking Van Buren without binding themselves to any definite policy. Because of his fame as a frontier hero, of the circumstance that a part of his home at North Bend, Ohio, had formerly been a log cabin, and of the story that cider, not wine, was served on his table, Harrison was derisively called by his opponents the "log cabin and hard cider" candidate; the term was eagerly accepted by the Whigs, in whose processions miniature log cabins were carried and at whose meetings hard cider was served, and the campaign itself has become known in history as the "log cabin and hard cider campaign." Harrison's canvass was conspicuous for the immense Whig processions and mass meetings, the numerous "stump" speeches (Harrison himself addressing meetings at Dayton, Chillicothe, Columbus and other places), and the use of campaign songs, of party insignia, and of campaign cries (such as "Tippecanoe and Tyler too"); and in the election he won by an overwhelming majority of 234 electoral votes to 60 cast for Van Buren. President Harrison was inaugurated on the 4th of March 1841. He chose for his cabinet Daniel Webster as secretary of state, Thomas Ewing as secretary of the treasury, John Bell as secretary of war, George E. Badger as secretary of the navy, Francis Granger as postmaster-general, and John J. Crittenden as attorney-general. He survived his inauguration only one month, dying on the 4th of April 1841, and being succeeded by the vice president, John Tyler. The immediate cause of his death was an attack of pneumonia, but the disease was aggravated by the excitement attending his sudden change in circumstances and the incessant demands of office seekers. After temporary interment at Washington, his body was removed to the tomb at North Bend, Ohio, where it now lies. A few of Harrison's public addresses survive, the most notable being A Discourse on the Aborigines of the Ohio. It has been said of him: "He was not a great man, but he had lived in a great time, and he had been a leader in great things." He was the first territorial delegate in the Congress of the United States and was the author of the first step in the development of the country's later homestead policy; the first presidential candidate to be selected upon the ground of "expediency" alone; and the first president to die in office. in 1795 he married Anna Symmes (1775-1864), daughter of John Cleves Symmes. Their grandson, Benjamin Harrison, was the twenty-third president of the United States.